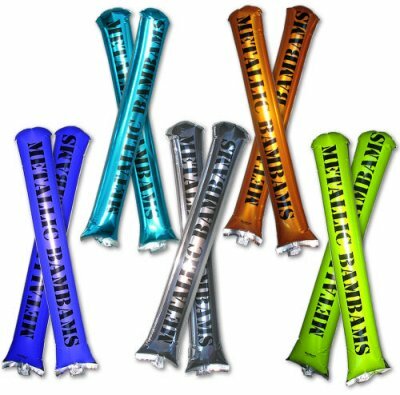 Metallic PubliStix add sparkle to the ever popular inflatable noisemakers. These enhanced crowd pleasers are made of a shiny Mylar-like polyethylene for use at various games, events, and celebrations. Considering having sponsors place their logo on the back of your Metallic Stix and raise funds. Up to 4 logos can be placed easily. Grab extra attention with these shiny metallic PubliStix! Want to make your own unique custom inflatable? We’ll make it for you. Call us today.